If someone were to give me a blank check, my passport and laptop, and three months off from all work and responsibilities, I’d head to Russia. I’ve been wanting to go there since I was a teenager—entering the country by the Trans-Siberian Railway from China, preferably—but the cost and time needed to make a significant trip there are both prohibitive right now. With three days and a lot less money, though, I was able to visit a slice of Russia much closer to home: Harbin, in the far northeastern corner of China. Harbin had been a fishing village when Russian railway workers and engineers arrived there at the end of the nineteenth century, tasked with linking the Trans-Siberian Railway to Vladivostock. This group was quickly followed by bankers, entrepreneurs, and people engaged in all sorts of other professions, who saw opportunity in Russia’s new Manchurian outpost. They built the village into a city—the “Little Paris of the Far East”—administered by the tsar’s officials until the 1917 revolution. After that, the city came under Chinese control, and its new leaders set about creating a Chinese Harbin, though the foreign population remained an important presence in the small metropolis. In addition to Russians, there were also Koreans, Japanese, and Eastern Europeans, with an especially vibrant Jewish community. This era of Harbin’s Russian past has now enabled the local government to promote tourism through a celebration of its “architectural museum” in the old colonial district, which is filled with early-twentieth-century buildings sporting ornate, European-style façades, most frequently described by placards as “Baroque” or “eclectic.” This development has turned Zhongyang Dajie (Central Street) into a cobblestoned pedestrian-only shopping zone, lined with outlets of the same clothing chains that fill Huaihai Zhong Lu near my apartment in Shanghai. Shopper-tourists can refresh themselves at KFC, McDonald’s, or Starbucks, though there are also a couple of small Russian restaurants on the street for anyone who desires a taste of the past. And if they’d like to take home a souvenir, they can stop into one of the many shops selling Russian tourist tchotchkes, such as matryoshka dolls, fur hats, and tea sets (as well as vodka and chocolate, of course). Very typical of Zhongyang Dajie: old building, chain restaurant. I spent a fair amount of time wandering up and down Zhongyang Dajie, but I tired of the music pouring from clothing stores and the touts trying to lure me into restaurants. 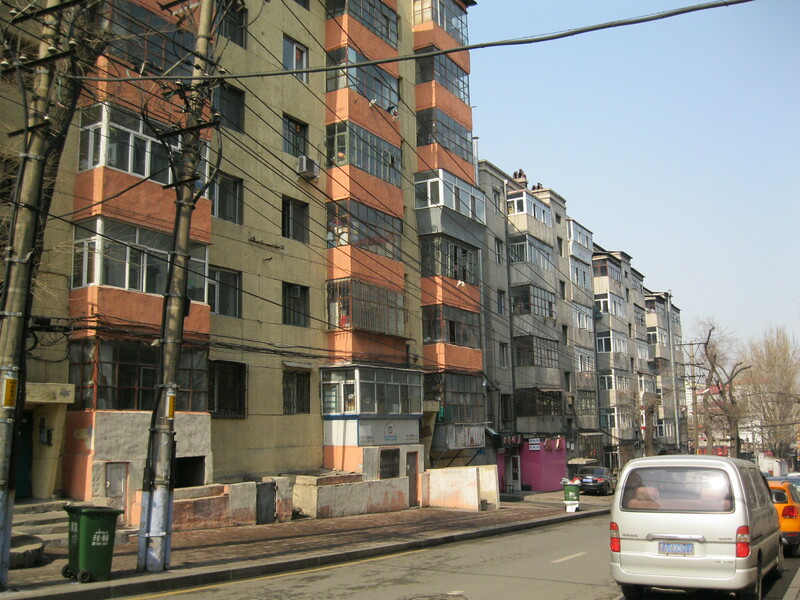 Though the city promotes the street as a living museum, the architecture that I was there to see is really beside the point: they could have demolished all the old buildings and constructed exactly the same stores, and people would still probably flock there to shop and eat, as they do in Shanghai, and Nanjing, and everywhere else. Preserving the old façades makes Zhongyang Dajie more interesting than similar streets in other Chinese cities, but doesn’t do much to promote knowledge about Harbin’s past. Far more interesting, I thought, are two museums that truly do engage with Harbin’s history and explain the city’s uniqueness. The first is housed inside Saint Sophia’s Cathedral, a gorgeous Byzantine-style church built by the Russian Orthodox community. 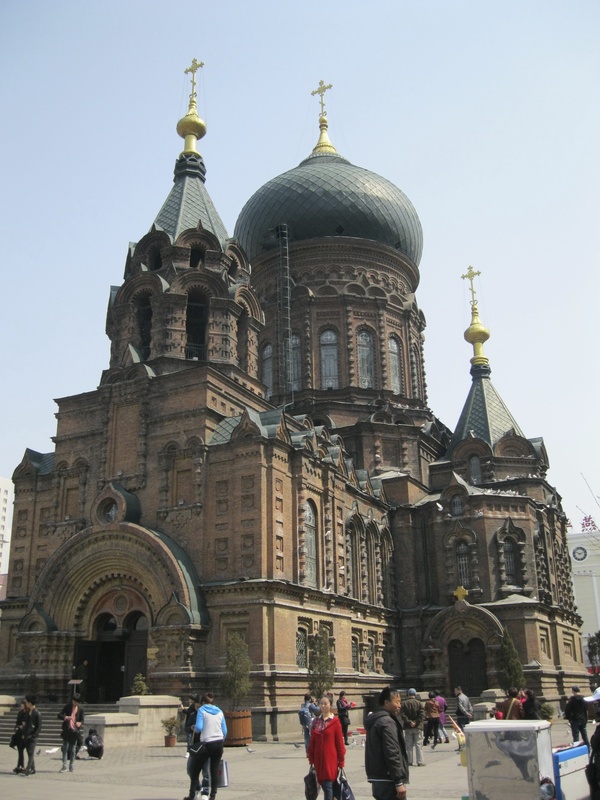 The Communists closed the church after the establishment of the PRC, but in the late 1990s, city leaders restored St. Sophia’s and installed a photo exhibit of life in Harbin before 1949. The exhibit highlights the city’s cosmopolitan past and celebrates both the Russian and Chinese communities that contributed to Harbin’s growth in the early twentieth century. (Not as much attention is given to other groups living in the city, though there are a few references to the “illegitimate Japanese government” of the 1930s.) When I arrived there on Friday morning, the museum was crowded with visitors examining the old photographs and pointing out small details to each other. On Saturday, though, I had another museum practically to myself; the guard at the entrance to the Harbin Museum of Jewish History seemed surprised to have a visitor and rushed to turn on the lights so I could look around. 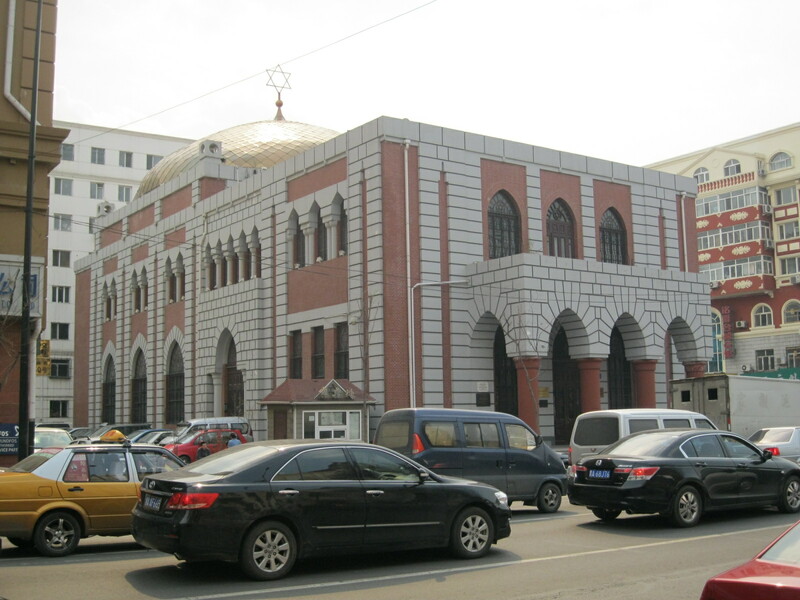 The museum occupies the second and third floors of the New Synagogue (the first floor contains a collection of rather terrible oil paintings of Ye Olde Harbin), and the exhibits tell the story of Harbin’s Jewish community. 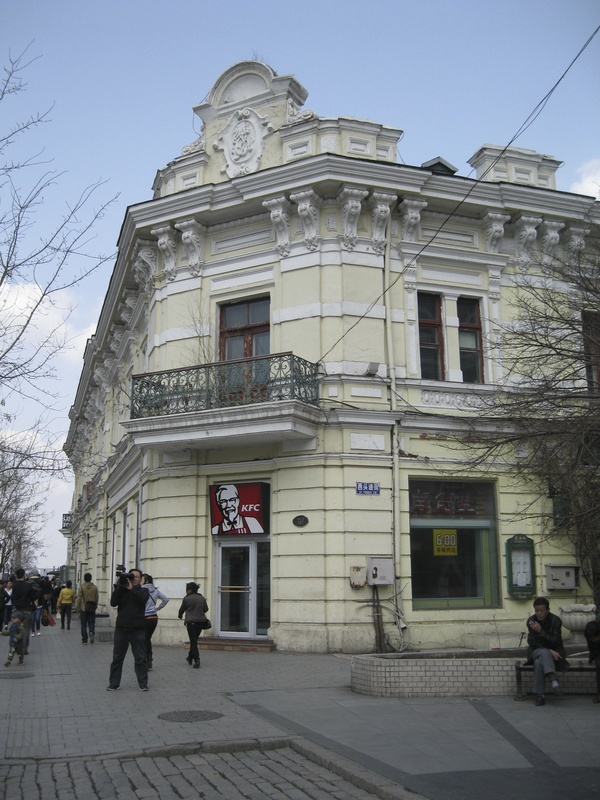 Many of the buildings now sheltering clothing stores and Starbucks on Zhongyang Dajie were built by Jewish business owners a century ago; the city also had a massive Jewish high school (still standing) and what appears to have been an active Zionist movement. The museum celebrates Harbin as a haven for European Jews fleeing persecution—using a quotation from Henry Kissinger to drive home the message—and the final exhibit spotlights the many people who now make trips to Harbin to see the city where their families resided before the Communist revolution sent them off into the world again. I enjoyed these ventures into Harbin’s past, and wished that more of my fellow tourists had torn themselves away from Zhongyang Dajie to explore the side streets. But I’d also say that three days is a good length of time to spend in Harbin, which journalist Isaac Stone Fish declared “China’s least livable metropolis” in a Foreign Policy article last year. I can see his point. I carefully scheduled my visit for the spring, since Harbin is renowned for its brutal winter weather, which enables it to hold a famous ice festival every February. Large sections of the city were built under Soviet supervision in the 1950s, and I passed what seemed to be miles of crumbling block housing. Harbin’s traffic might be the most anarchic in all of China, particularly in massive traffic circles that dump together buses, taxis, cyclists, and one frightened foreign pedestrian in a free-for-all. And the sidewalks—uneven, broken, and missing large chunks—would be an ambulance-chasing lawyer’s dream, ever-ready to turn an ankle or trip someone up. Most of the residential areas have seen better days.